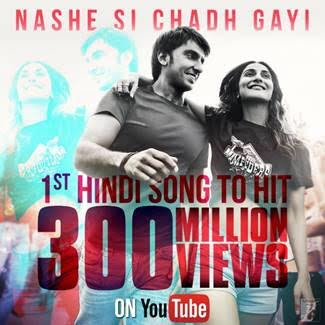 The smash-hit of 2016 and 2017, ‘Nashe Si Chadh Gayi’ song from the film BEFIKRE crosses 300 million views on YouTube making it a first ever for a Hindi song. This unbeatable song released by YRF Music, continues to strengthen its #1 position as the most-viewed Hindi song on YouTube by becoming the first to surpass a massive view count of 300 Million. Ever since its release on the official YRF YouTube channel, it has been breaking records.‘Nashe Si Chadh Gayi’ first shattered YouTube’s record for most views for a Hindi film song in a 24-hour timespan. The song reigned playlists and had an unprecedented run across leading music streaming platforms and music charts. And earlier this summer, it was the first Hindi song to rack up 250 and 275 million views, within a year of its release. This momentous occasion for this dance number can be attributed to the electrifying dance chemistry of Ranveer Singh and Vaani Kapoor choreographed by Vaibhavi Merchant, the raving tunes composed by Vishal and Shekhar, Jaideep Sahni’s lyrics, Arijit Singh’s voice and the carefree vibe of Paris – all these elements combined to make ‘Nashe Si Chadh Gayi’ a runaway hit.